Gas flow on a barbecue grill is controlled by the regulator. This part connects to the propane tank and uses a hose attachment to push gas to the grill. Cooking exposes all parts of your grill to grease buildup and debris from the food. When the hose that feeds the flame clogs, you must remove it to clear the blockage. Once clean, testing the connection ensures there is no leakage of gas that would make the grill dangerous to use. 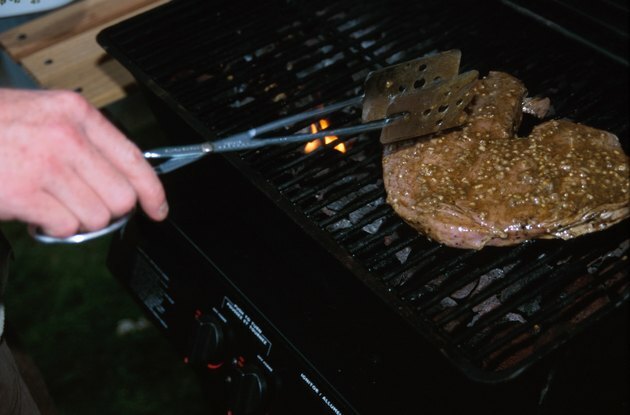 A clogged hose will prevent the grill from lighting. Turn the valve on the tank counterclockwise until it stops. This will turn off the gas going to the grill. Unhook the hose from the grill and the regulator. The method will depend on the model you own. In many cases, all you need to do is turn the nut attaching the hose counterclockwise until the connection comes free. Soak the hose in warm, soapy water for a few minutes to clean it. Use a grease-cutting dish soap. Rinse the hose under running water and allow it to dry. Mix 1/4 cup of dish soap and water in a bowl. The solution should contain an equal part of both. Reconnect the hose and brush all connections with this solution. This would include the connection between the regulator and tank, the regulator and hose, and the hose and grill. Turn the valve on the tank clockwise one full turn. Look at the connections. If you see bubbles form anywhere, turn off the gas and tighten the connection. Repeat the test until you see no more bubbles.